In December last year I hopped on a plane for what must have been the first time in over eight years (maybe more). To say that I was a little nervous would be somewhat of an understatement. I had forgotten what it had felt like to sit back in your chair, strapped in and bags safety tucked away in the compartments above your head. I had forgotten what it felt like to feel the plane slowly come to a halt at the head of the runway and to then suddenly burst into a force of energy which pushes you back into your seat. I had forgotten that rather strange sinking feeling in your belly as you take off and then leave the ground; that is something which I feel I will never quite get used to. As you leave the safety and comfort of the ground and set off on a new adventure it is both exciting and a little daunting, however after just one minute the nerves settle and you can happily sit back and enjoy the journey and silently pray that you do not encounter any turbulence. 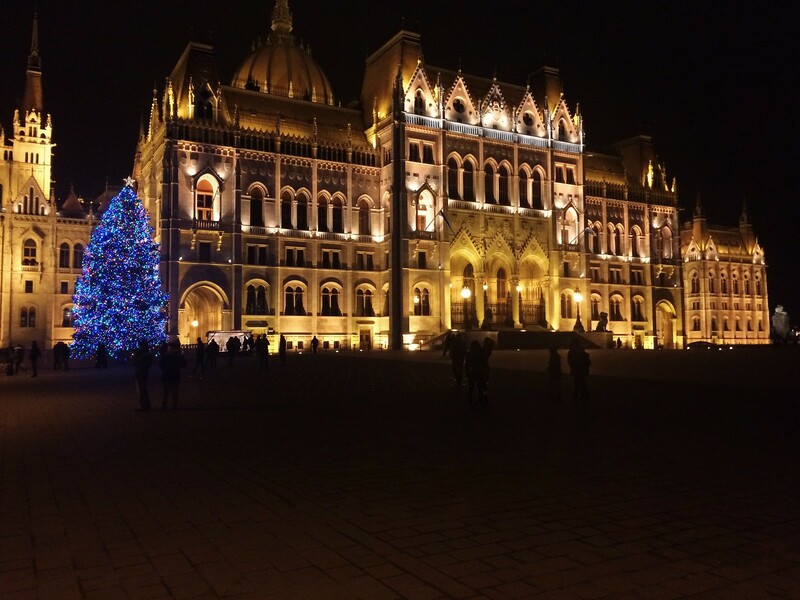 Jetting off to Budapest in Hungary was somewhere that I had never really thought of going up until we were looking for a Christmas break as we had ideally wanted a location where the local Christmas markets would still be running. Most European Christmas markets end just before Christmas day, however luckily for us we discovered that the markets were running right up until New Year’s Eve in Budapest. This was initially the factor which led us to go there because due to work commitments I had not been able to go before the Christmas holiday, although having said that we also managed to find a good deal too which of course helped. Our hotel was situated in the middle of the city centre which gave us easy access to all the main attractions and transport links. However, getting to the city centre from the airport had looked to be in principal very easy, as it involved one bus and then underground train. Unfortunately, it did take quite a long time, which upon reflection was the only downside to the entire trip. Luckily our hotel was in a very good spot and the room was more than adequate for our three night stay. 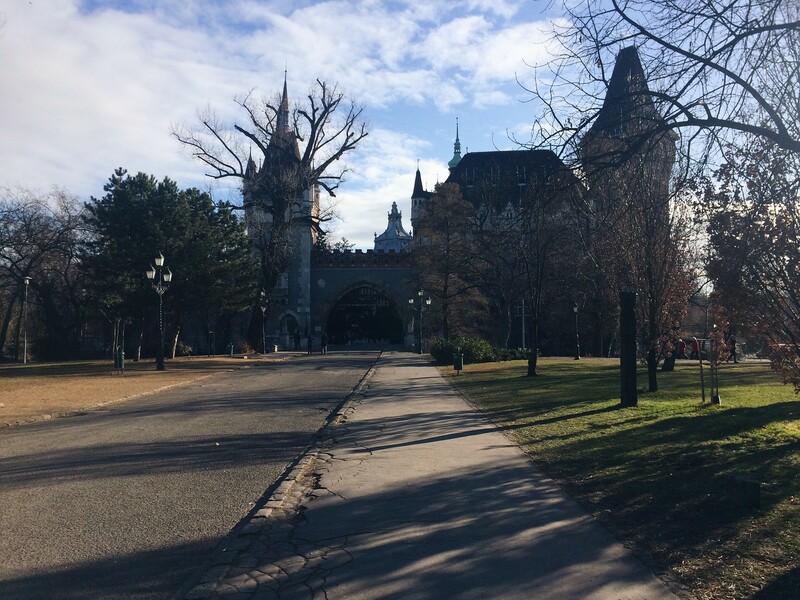 Upon exploring the city centre we stumbled across Vajdahunyad Castle which is situated within the city park. It has an array of different types of architecture such as Gothic, Renaissance and Romanesque. 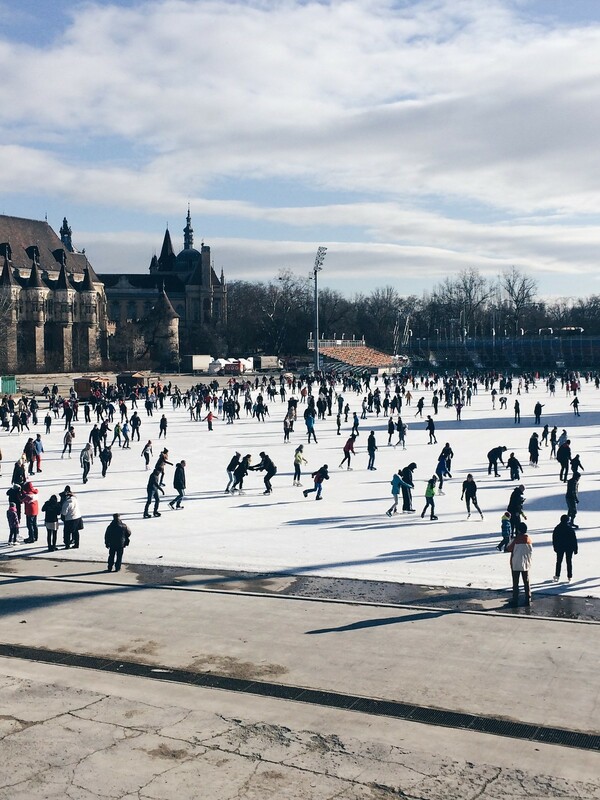 Originally built for the 1896 millennium celebrations it consisted of only a wooden structure, however the locals of Budapest loved it that much that it was soon re-built in order to make it a permanent structure. We had a little explore of the area and paid to go up into the tower, however whilst it was incredibly pretty to look at we decided not to go on the tour as we were heading off to visit our next destination. Before we arrived, we had only really set one specific thing which we had wanted to do; this was to visit one of the famous thermal spas located within the city. 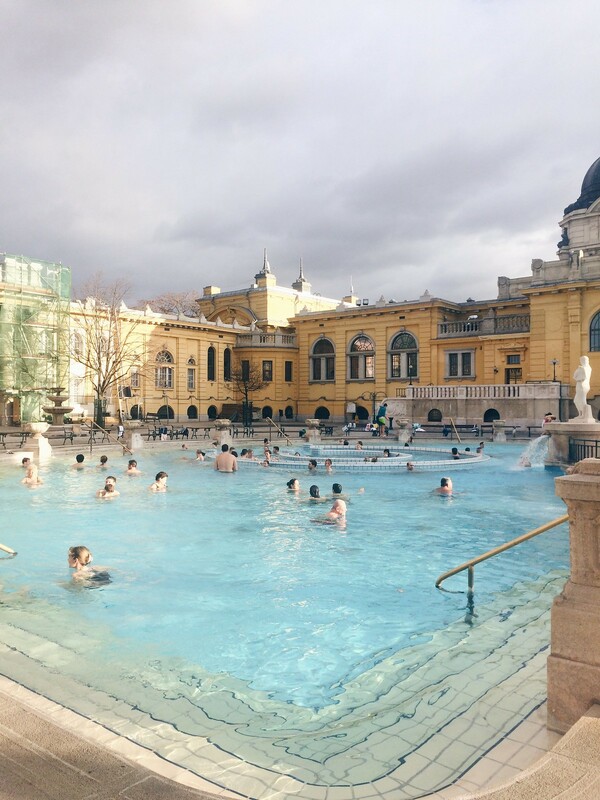 We decided upon the Széchenyi Medicinal Baths which is the largest medicinal bath in Europe. The water is supplied by two thermal springs which together complete a total of 21 pools, all of which have varying temperatures ranging from 27-38°C. The Széchenyi Medicinal Baths were easy to get to via the tram system and were relatively affordable at just under £15 a ticket. This provided you with a day pass and the use of a cabin in which you could get changed and securely store your belongings whilst in the baths. The image directly below was the only pool that was for swimmers, if you wish to actively swim you also need to bring with you a swimming hat. Every other pool was purely for relaxation and medicinal purposes, there were even some locals sitting playing chess in the pools which I thought was really nice. The pools were quite clean although also rather busy, having said that due to the amount of pools available I found that it never felt claustrophobic. There are three outdoor pools which are of course also the largest, the rest of them are all situated inside surrounded by marble walls and intricate design. 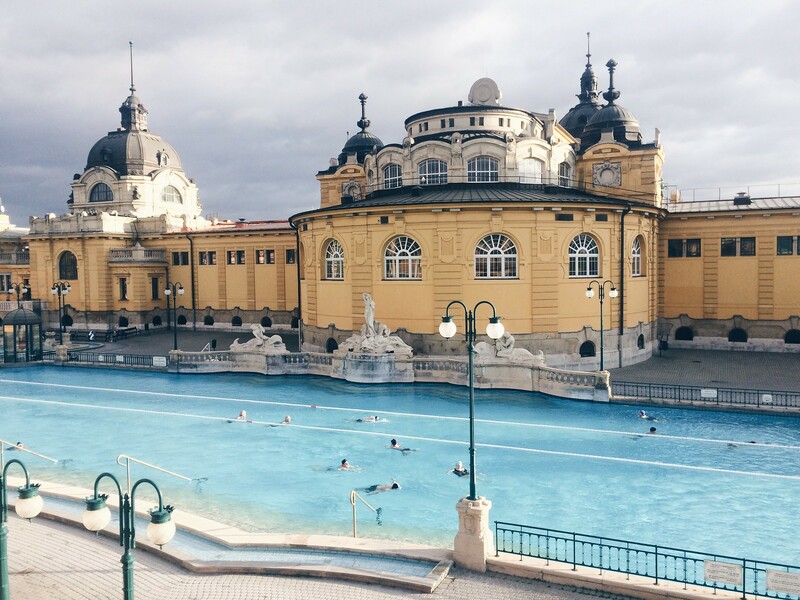 Without a doubt, I would highly recommend a visit to the Széchenyi Medicinal Baths if you are in Budapest, they were incredibly beautiful and helped to show off part of the culture of this incredible city. Of course, as it was Christmas time the city was lit up beautifully. 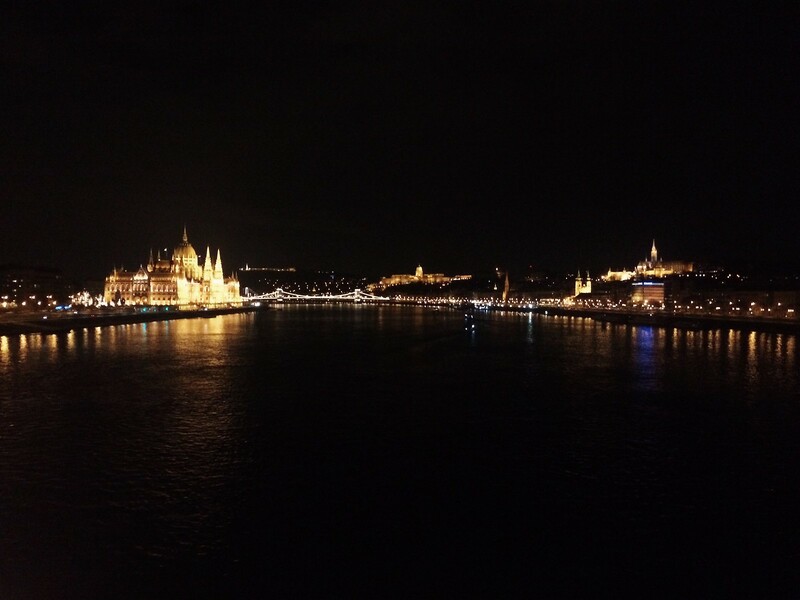 The numerous bridges across the river Danube were dazzling and the buildings along the river bank were equally as stunning. In fact , on the first night of our arrival we stood in the middle of the bridge and simply marvelled at the view; it truly was beautiful. We also took a mini cruise up the river, which I unfortunately cannot remember the price of. There are a lot of boats which offer these tours throughout the day and evening, some even offer food and drink which you can enjoy as you find out more about the history of Budapest and the buildings situated along the river. Whilst in the city we encountered extremely friendly people who were all most certainly still in the festive spirit. We dined in the ruin bars of an evening after exploring what they had to offer, an honourable mention goes out to Kőleves which was divine! The city truly is beautiful at night and should definitely be explored as there is still plenty going on long after the sun goes down. 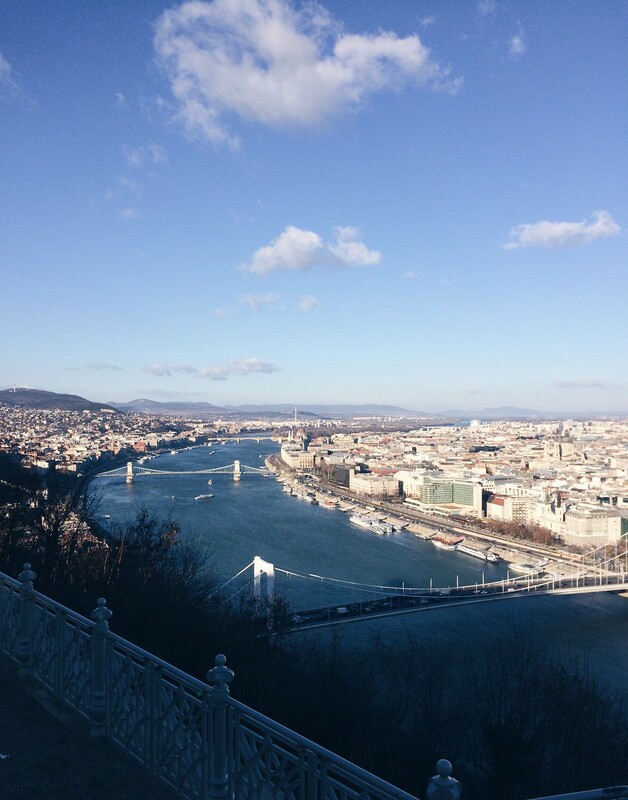 Overall if you are thinking of heading off to Budapest then I would definitely recommend it. We only stayed for three nights which I think was just enough time in order to see the main sites and to experience the city, however I do think an extra day or two could easily have been filled with more things to do. Honourable mentions also go out to Fisherman’s Bastion, Heroe’s Square and Buda Castle.